Directions: The Baltimore Inner Harbor is the revamped fresh face of Charm City. This area is best photographed from the Federal Hill Park off of Key Highway. 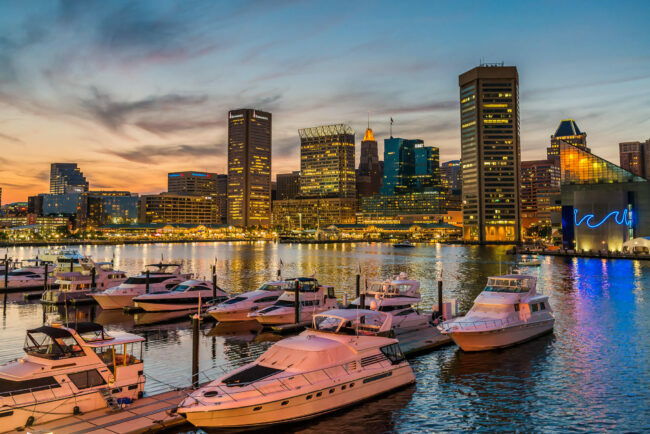 The Inner Harbor in Baltimore is the revamped family friendly corner of Charm City. The area offers a world class aquarium, restaurants and an incredible view. The top image was captured at dusk mid-summer just as the street/building lights were turning on. The area it was captured did not allow for tripods so that image was captured hand held while bracing against a pole. The following image was from the high vista of Federal Hill Park. With a sturdy tripod the three image panorama was captured at 1040PM just before the park closes at 11PM. While street parking at meters are available on Key Highway, please use caution as the meters are enforced 24hr/day and zone infractions are heavily fined! 1. Try to arrive just before dusk to capture the city BEFORE the field lights turn on (which I couldn’t do). 2. Use 50mm or longer lens on full frame to adequately capture the scene. 3. Tripod, shutter release, eye piece cover, delayed shutter highly recommended.